Try our second free SAT Math practice test. This one is a little more challenging, with a mixture of easy and medium level practice questions. You are permitted to use a calculator on this portion of the math test, but you won’t need it for every question. Topics include linear equations, inequalities, problem solving, and functions. Continue your test prep with these SAT Math practice problems. The use of a calculator is allowed. Solve each problem and select the best of the answer choices provided. Franklin bought several kites, each costing 16 dollars. Richard purchased several different kites, each costing 20 dollars. If the ratio of the number of kites Franklin purchased to the number of kites Richard purchased was 3 to 2, what was the average cost of each kite they purchased? If (m,ƒ(m)) represents a point on the graph ƒ(m) = 2m + 1, which of the following could be a portion of the graph of the set of points (m,(ƒ(m))2)? Let’s re-write the “m” as an “x” to better understand how this function would look on an xy-coordinate plane. The correct answer is (C). This function translates graphically into a parabola with a vertex at (−½, 0) that is vertically stretched and opens upwards. Only answer choice (C) shows an appropriate possibility. The correct response is (D). Start by drawing the figure. If the radius of A is 3, then its diameter is 6. Its circumference is 2πr = 2(3)π = 6π. B’s circumference is four times A’s circumference. B’s circumference = 4(6π) = 24π. 24π = 2πr, so B’s radius must be 12. Its diameter is then 12 * 2 = 24. The difference between the diameters is then: 24 – 6 = 18. Line F can be described by the function ƒ(x) = 5x. 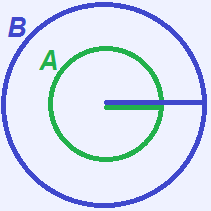 Line G is parallel to Line F such that the shortest distance between Line G and Line F is c, and the y-intercept of Line G is negative. Which of the following is a possible equation for line G? The slope-intercept form of a line is y = mx + b, where m is the slope and b is the y-intercept. Parallel lines have the same slope, so Line G must also have a slope of 5. Therefore, we can eliminate choices (A) and (C). Since the y-intercept of Line G must be negative, we can eliminate choice (D). Thus, the answer is (B). VitaDrink contains 30 percent concentrated nutrients by volume. EnergyPlus contains 40 percent concentrated nutrients by volume. Which of the following represents the percentage of concentrated nutrients by volume in a mixture of v gallons of VitaDrink, e gallons of EnergyPlus, and w gallons of water? The total number of gallons in the final mixture will be the sum of all the components: v + e + w.
There are 0.3v gallons of nutrients from VitaDrink in the mixture, 0.4e gallons of nutrients from EnergyPlus in the mixture, and no nutrients from the water. The total number of gallons of nutrients in the new mixture will be 0.3v + 0.4e. If you chose (B), remember that the question was asking for the percent, not the actual number in the mixture! What is the value of y, if lines a, b, and c are parallel? 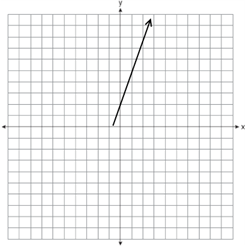 What is the sum of the areas of the three rectangles that are drawn below the graph of the line y = 2x? Start by plugging x = 1, x = 2, and x = 3 into the equation y = 2x. This will determine the y-coordinates where the corner of each rectangle touches y = 2x. Those y-values will be the height of each rectangle. Since we know each rectangle is 1 space apart, we can then find each area. Adding up the areas, we get 2 + 4 + 8 = 14. 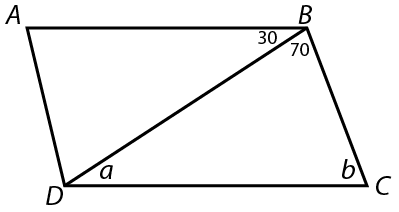 If AB is parallel to DC, and AD is parallel to BC, then what is the value of b − a? If AB is parallel to DC, then BD is a transversal. Alternate interior angles between two parallel lines cut by a transversal are equal. ∠BDC = ∠ABD, so a = 30°. The speed of a subway train is represented by the equation v = t2 + 2t for all situations where 0 ≤ t ≤ 7, where v is the rate of speed in km per hour, and t is the time in seconds from the moment the train starts moving. In km per hour, how much faster is the subway train moving after 7 seconds than it was moving after 3 seconds? For this word problem, we are asked for the difference between the train’s speed after 7 seconds, and the train’s speed after 3 seconds. v(7) − v(3) = 63 − 15 = 48, which is answer choice (D). The table above, which describes the New York City workforce, is only partially filled. Based on this information, what proportion of the total New York City workforce are unemployed women? Thus, 3,500 women in the New York City workforce are unemployed. Which of the following input voltages would most likely result in an Intensity of 30 Lumens according to the line of best fit? Voltage = 16.0 is the best answer. What is one possible value of x + 2 for the equation below? A company uses an additive manufacturing (“3D Printing”) process to create square pyramids as shown in the illustration. If the 3D printer can print 0.025 cm3 per second, how many minutes will it take to print one pyramid? On a certain street there are 7 houses. 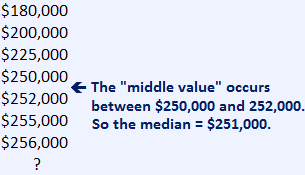 The value of each of these houses is provided in the table below. An 8th house is being added on the same street and will have a value in excess of $255,000. 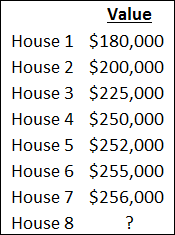 What is the lowest value that this new home can have such that the mean of all 8 house values will be greater than or equal to the median of the 8 house values? House 8 will cost \$390,000 or more. 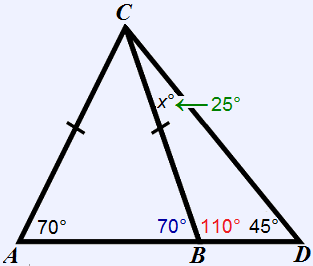 Triangle ABC is the isosceles triangle shown in the illustration below. ∠A = 70° and ∠D = 45°. Points A, B, and D are colinear. Find x, the measure of ∠BCD. Angles ∠ABC and ∠CBD form a linear pair — meaning they are supplementary (i.e. ∠ABC + ∠CBD = 180°). The angles of △BCD must add to 180°.